Editor's note: This week, we’re in Chicago at ISTE connecting with thousands of educators and introducing our latest tools and features. In this post, we dive into some features on the new Acer Chromebook Tab 10 and other next gen devices, designed to inspire new heights in creativity for students and teachers alike. Follow along all week for updates on Twitter and Facebook, and if you’re at ISTE, visit us at booth #1602 to learn more, say hello to our team and test out our latest classroom tools. We’re here to help teachers plan for the upcoming school year with new updates and features to Chromebooks, AR and VR, and more. Get ready to add a little more creativity into summer-syllabusing—the opportunities for sparking inventive and imaginative thinking in students have never looked brighter. The Acer Chromebook Tab 10, the first Chrome OS tablet designed for education, is now on sale from resellers in the U.S., and it’s coming soon to other countries. 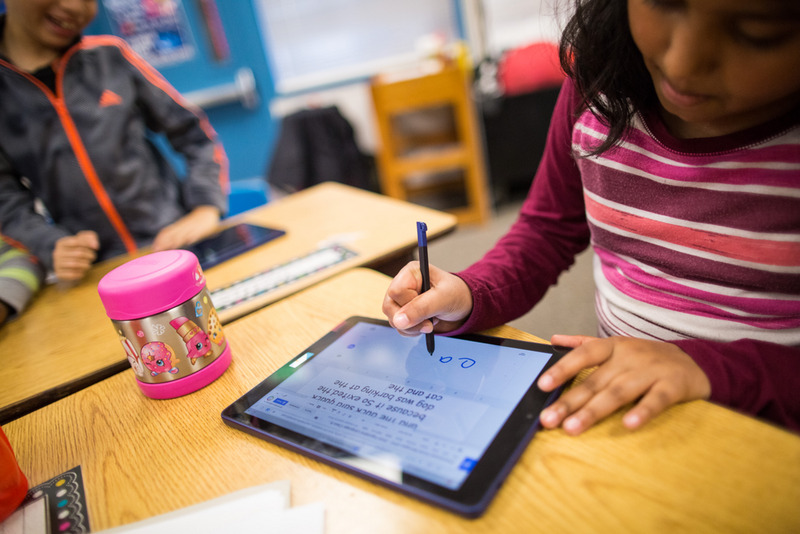 These devices have the same speed, ease of use, manageability, shareability, security and affordability that educators are used to with Chromebooks—but in a lightweight, durable tablet. Plus, with a built-in stylus and cameras on both sides of the device, students can create imaginative multimedia projects from anywhere. USB-C charging means a cart of standard USB-chargers can handle any future model of Chromebooks. Over one million students explored tornadoes, planets and more through augmented reality (AR) during the Expeditions AR Pioneer Program this year, and now we’re bringing AR to the Acer Chromebook Tab 10. AR Expeditions will be available on the tablet this fall and until then, you can explore virtual reality (VR) field trips in full screen today! And for all of the education developers out there with visions of using AR in your product, you’ll be able to bring AR experiences to life on the Acer Chromebook Tab 10, the first ChromeOS device to support ARCore, coming this fall. We can’t wait to see what you create. We’ve also opened the world of VR creation to everyone through Tour Creator. Using footage from 360° cameras or picking from the huge library of existing Street View content, teachers and students can make their own VR tours. With features like annotations, ambient audio and narration, you can add details and facts into the tour. And because Tour Creator is a web-based application, anyone can start experimenting and creating their own VR experiences—with no prior knowledge or experience—on any Chromebook, today. We’ve partnered with pencil company Staedtler, a name synonymous with good-old fashioned analog learning, to develop a stylus that students can share across devices. The STAEDTLER Noris digital for Chromebook stylus requires no pairing, requires no charging or battery, and is designed with affordability in mind. Along with the annotation feature in Classroom, educators can give handwritten feedback and assign PDF worksheets that students can annotate with their stylus. Does this stylus work with other apps? App-solutely. Try Squid to sketch ideas, Jamboard to collaborate in real time, or Explain Everything to create stories and turn ideas into understanding. Expect these scribbling towards a store near you later this summer. More devices and more tools mean a greater need for effective management, and we’re rolling out a range of new admin capabilities before back to school. One long-requested feature that’s available now is device off hours, which allows schools to flexibly manage “bring your own device” programs. Admins can set a schedule to allow for full device management during the school day, while certain policies will not be enforced during the evenings at home (allowing parents and other family members to use the device). Admins can check out the rest of the management features in our revamped release notes in the Chrome Help Center and can also subscribe to be informed via email. In the past, teachers have been concerned that students get distracted, browse the web for answers or chat with other students during assessments in Google Forms Quizzes. To keep wandering pupils on task—and put educators at ease—we’re launching locked mode in Quizzes on managed Chromebooks, which locks students’ screens and prevents them from navigating away from the Quiz until they submit their answers. Once the student hits the submit button, they can resume normal use of their Chromebook. Locked mode is fully managed by teachers, which gives educators control over assessments without needing help from their IT administrator. Get ready to show what you know, because locked mode is coming to users this fall. Our mission is to not only help teachers be more organized and efficient, but more importantly, enable them to unleash the creative potential of their students. As we continue to update and improve our Google for Education tools and devices, we encourage teachers and guardians to try out new devices and apps, and to let us know what you think. Have fun at ISTE and we’ll see you at teacher karaoke!